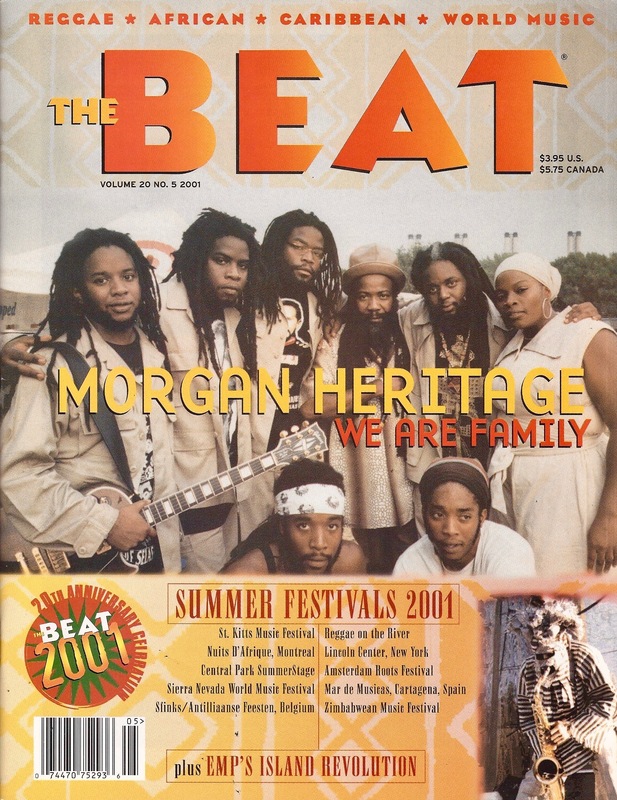 Reggae group Morgan Heritage, appearing Fri., Sept. 8 at BB King Blues Club in New York, was featured on the cover of The Beat in 2001. Exemplifying Rastafarian roots and culture, the band is a family affair comprised of five siblings, all children of the veteran reggae star Denroy Morgan. Their star began to rise on the reggae scene in the mid-‘90s, and at the time of this article they had six albums under their belts and were touring extensively. To date, they have a total of 13 albums out, including their most recent, Avrakedabra, reviewed here by Afropop’s Christopher Stoddard. The Morgan Heritage story is here told by Beat writer Tom Orr, who became an instant fan of the group while seeing them perform at the 2000 Bob Marley Day festival in Los Angeles. ABOUT “BEST OF THE BEAT ON AFROPOP” The Beat Goes On!